On October 30th, Wembley Stadium hosts an NFL game between the Washington Redskins and Cincinnatti Bengals. This is the latest fixture in the NFL international series, which has been popular in the UK since 2007. 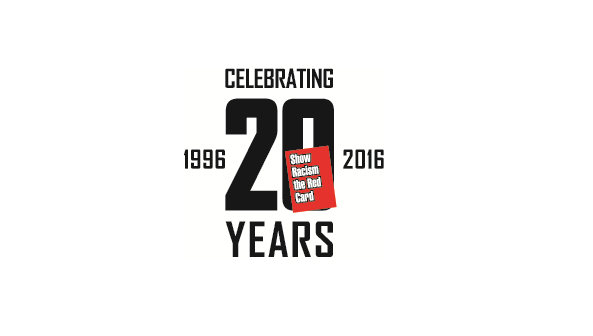 SRtRC supports the growing movement in America and beyond, which encourages the Washington team to drop the word ‘Redskins’ from their name. The term ‘redskin’ is generally considered ‘disparaging’, ‘offensive’ and ‘taboo’ and this was solidified in litigation in the court cases, Harjo vs. Pro Football and Blackhorse et. al. vs. Pro Football where Native Americans won their cases to strip the Washington team of their racial name. In 2014, Amanda Blackhorse and her fellow plaintiffs Marcus Briggs-Cloud, Jillian Pappan, Courtney Tsotigh-Yarhlor, and Phillip Gover won their case before the Trademark Trial and Appeal Board under the United States Patent and Trademark Office to cancel the term “redskin”. This means the team was not able to profit solely off their name. While the Blackhorse et.al. plaintiffs prevailed in court, the Washington team continues to appeal this decision. While the case is pending in court, the Washington team is allowed to use their slur name. Currently the case is in the fourth circuit court of appeals and may be headed to the Supreme Court of the United States in the fall of 2016. The fight to end the use of the r-word is strong in North America as many elementary and high schools are dropping their names in the United States and Canada. In February 2016, Labour MPs Ruth Smeeth and Ian Austin wrote to the NFL Commissioner, Roger Goodell to complain and raised the issue in parliament. In their letter they said “'As one of the US' biggest cultural exports finds success in the UK the sport's values and standards come with it. 'Unfortunately, it is apparent that within these values there is a deliberate insensitivity and apparent hostility to a prominent minority group. 'In Britain there has been a concerted effort to remove racism from our national sport, football, with grassroots campaigns such as Kick It Out and Show Racism the Red Card working hard to ensure equality and respect both on and off the pitch. In 2013, Barack Obama said that if he was the owner of the Redskins he would consider changing the name because it offends many Native Americans. Native American people in the United States are small in ratio to the US population but have garnered a tremendous amount of support throughout uniting tribes and national Native American advocacy groups in the recent years. In addition, over recent years the number of groups and individuals encouraging Washington to change their name has grown. Groups like Not Your Mascots are encouraging not just Washington, but other teams to reconsider names and branding which use Native American names and imagery. The American Psychological Association as called for the immediate retirement of Native mascot as create a hostile environment for Native youth as well as decreased their self esteem. Psychologist Stephanie Fryberg also found that while Native mascots and stereotypes of Native people, decreases the self-esteem of Native youth, at the same time, it increases the self-esteem of non-Native youth. This implies that Native mascots not only are disparaging to Native people but have damaging psychological effect on Native American youth. In 2013, Dr. Richard Lapchick, director emeritus of Northeastern University's Center for the Study of Sport in Society, in an article: "Could you imagine people mocking African Americans in black face at a game? Yet go to a game where there is a team with an Indian name and you will see fans with war paint on their faces. Is this not the equivalent to black face?" Use of Native American imagery and names have been used in sports in America for many years. Teams including the Atlanta Braves, Cleveland Indians and Kansas City Chiefs have come under pressure to change logos and mascots. In the USA, the use of Native American mascots in high schools has decreased from 3,000 to around 2000. This form of cultural appropriation has of course spread beyond America. In the UK there are several teams in a variety of sports which use such names. In London since the 1970’s there has been an ice hockey team called the Streatham Redskins, as team owner, William Rost explained in a Vice Sports article earlier this year – this is changing "I realised we had to change the name because the idea that anything associated with this club could be seen as discriminatory or offensive to any group of people is against everything we stand for. "We have been a multicultural club since our formation and we are proud to represent such a richly diverse area as Streatham." Show Racism the Red Card will support groups from the USA and Europe who are campaigning on these issues and have had several interesting conversations over the last few months. We encourage the NFL to look again at this issue and organisations and individuals to contact the league, Wembley Stadium, politicians and the media to express their opinion. It cannot be right that in the 21st Century, misappropriation of imagery and practices and stereotyping about a diverse range of subjugated peoples – Native Americans – can be allowed to continue. We will continue to update and share information over the coming month.